Los Banos— It’s plenty of tight-ﬁsted, jaw-set grit and determination to get clean water into the Grasslands Refuge region for ducks and duck hunters this year. And the battle has just begun. The payoff is right now, however, for water- MALLARDS and pintails are two of the major targets at Los Banos, but Refuge hunters should also get a shot at gadwall, teal and shovelers now and geese later in the season, stay tuned with our Refuge Hunting Reports as season progresses. Zone 6 shapes up as one of best bet for prime California Duck Hunting on the opener and after at Los Banos Refuge. It offers 14 spaced blind areas on the high-yield northern end of the zone and last year produced limit shooting for many hunters opening day. This year’s users should again see ﬁrst-class early season action. There are ways to boost the odds wherever you're hunting on Los Banos Refuge, lots of decoys. Bring at least a dozen magnums, Mallards will do best early in the season. Later on, hunters should pack pintails. Besides mallards and pins. Los Banos hunters will take home some gadwalls, greenwing teal, shovelers and cinnamom teal on opening day, so plan your dekes accordingly. Sportsmen usually average three birds apiece or better on the opener. Camouﬂage, the more the better, will increase your chance at a limit in the permanent blinds of Zone 6, and in other areas, (Refer to our Refuge Hunting maps) where duck hunters have to build their own concealment. Tules and tumbleweed provides good blind materials. Hunters often pack the camo-type tarps and covering for extra cover, Hip waders are useful most of the season, but if the ﬁrst weeks are extra warm, you may enjoy the hunt more in short boots or tennis shoes. stay tuned with our Refuge Hunting Reports as season progresses. Those who show up early get the best shot at hunting areas not already reserved by the standard application procedure. Refer to our Refuge Hunting maps, and Depending on how close to the front of the line you are, there‘s a good chance you‘ll get in to hunt the popular zones 3 and 4, where a 1/2-mile hike will take you into the highly productive Area 14 and Field 2l. Another spot where shotguns usually smoke is the northeastern edges of Olsen Pond near Zone 6. Take along an I-shaped tule seat to keep up off the water. closure on dark geese, and plan on making a mid-November trip, when goose action really starts to gain momentum. Stay tuned for our Refuge Hunting reports as the season progresses. Los Banos has three hunting areas. Refer to our Refuge Hunting maps..There is a free-roam that when fully ﬂooded will accommodate 80 to 100. Hunters can set up their own blinds, and hunt anywhere they choose within the free-roam area. In addition, there are two zones with assigned blinds. Zone 14 blinds, each one can hold up to three hunters. Zone 7 four blinds. This zone is designed to provide junior hunters with an exceptional hunting experience. It will only happen a limited number of Saturdays, and each hunter must accompanied by a junior licensed hunter. You will need hip boots, but the doesn't get much deeper than 16 inches. Reservations are. recommended for all ﬁve areas, particularly if you are interested in hunting from an established blind. 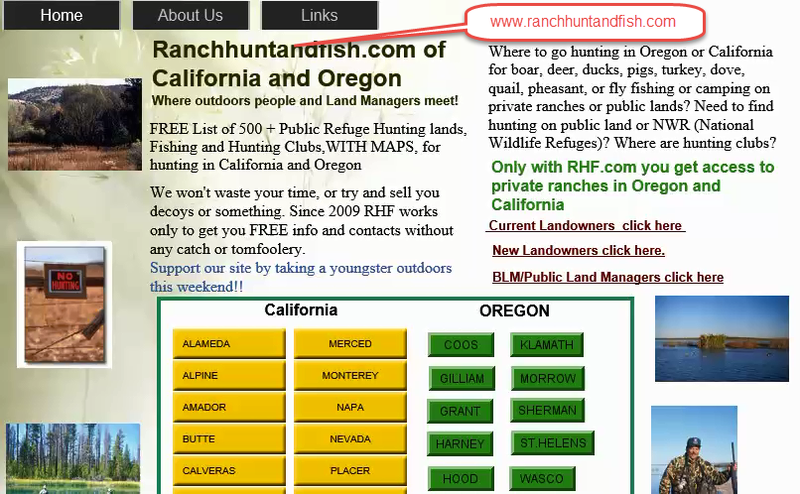 Reservations at free-roam areas are also recommended since they guarantee you access There is hunting on a ﬁrst-come, ﬁrst-served basis -the sweat line -which forms at the check in station prior to the hunting timer Hunters are allowed in if there are spaces available or no-shows 1n addition, hunters are let in as people leave. The cost for adults is $20 per day. Hunting private lands in California has several advantages over the public areas. Chief among these are much less hunting pressure, better forage and water supplies and easier vehicle access.